So you have more or less run out of stuff to watch on telly, and you are bored with your collection of Blu-ray discs which are starting to gather dust. 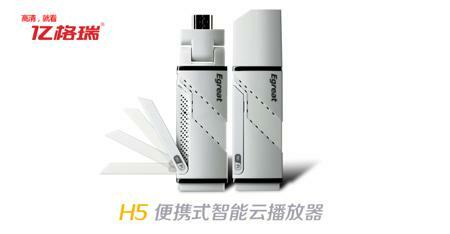 Well, here we are with an alternative which you might want to consider – the Android 4.0 TV STICK H5 from Egreat of China. Yes sir, this is another PC-on-a-stick model that Egreat hopes to be able to spread its wings to all countries worldwide. Just what kind of hardware specifications does the Android 4.0 TV STICK H5 pack underneath the hood? First of all, it will plug itself into any available HDMI port on your TV, where the dual-core 1GHz Cortex A9 processor will be able to chug along just fine, where it is aided by 1GB RAM, and will carry 4GB of storage space for a slew of apps and content for you to enjoy on your big screen TV. Android 4.0 Ice Cream Sandwich is the operating system of choice here, and the Android 4.0 TV STICK H5 will also play a host of video and audio files while delivering support for a range of online TV channels. Your ears will also appreciate the integrated FLAC lossless compression music player, while Full HD video transmission via HDMI ensures you will always be able to enjoy mind blowing visuals. No idea on pricing just yet, but TV Sticks do seem to have a place in our future.